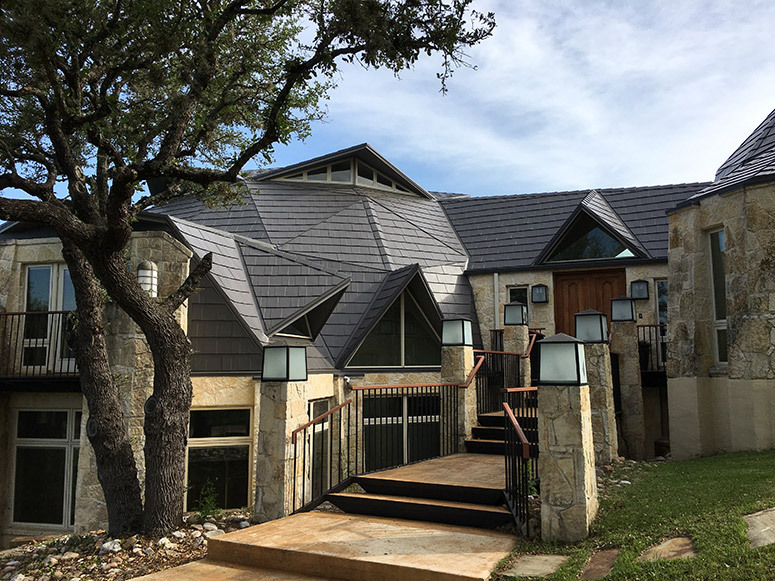 When the existing roof of the Wendel residence reached the end of its life due to a severe hail storm that destroyed thousands of roofs in and around San Antonio in early 2016, the homeowner knew that getting it replaced would be no simple task. 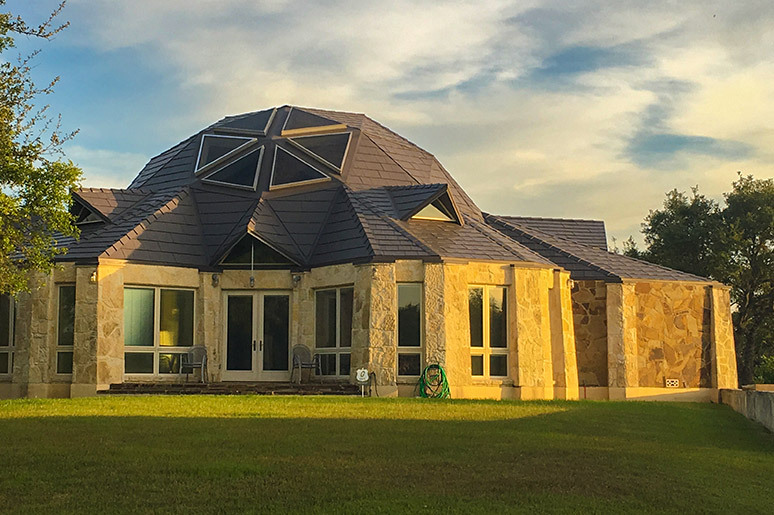 Located in Beorne, Texas, this home’s roof has over 200 facets and a surface area of 9,150 square feet. The most prominent features of this roof are its two geodesic domes, numerous dormers with flying gables, and many windows that are integrated into the roof. The homeowner decided to re-roof the home using Classic Metal Roofing Systems’ Oxford Shingle aluminum roofing system. They chose Dark Charcoal as the color to perfectly complement their distinctive home’s stone exterior of buff and tan colors. 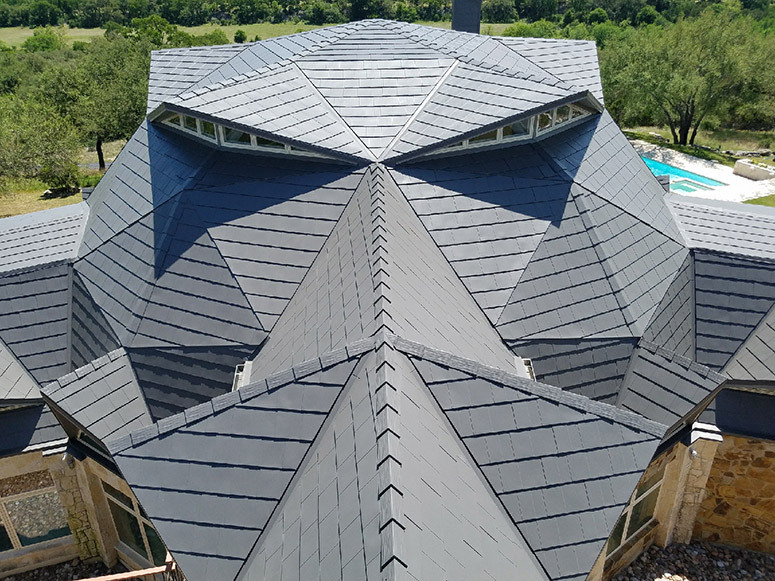 Al-Co Metal Roofing out of San Antonio, Texas served as contractor for the project with Bryan Wood and Sunshine Installations as the roofing installer. Though the incredibly low weight Oxford Shingle system can usually be installed over the old roof, in this situation it was determined to be best to remove the storm-damaged shingles before installing the new roof. In early 2017, the old roof was removed from the house and it came time for the new roof to be installed. “Nothing was easy with this project,” Chuck Roberts of Al-Co Metal Roofing stated. “Simply knowing where to start and in what order to install the new roof was a challenge.” One unique challenge that the contractor and installer had to face was having multiple roof facets at the same elevation with different pitches with the more gradual pitch shedding to the steeper pitch. Roberts expressed that he had never before had to deal with such a complex roof. The contractor made the project easier for themselves by establishing a common line of orientation which allowed them to reference each facet. In addition, they worked together with the installer to use the interlocking panels of the Oxford Shingle to their advantage. They copied this special interlocking characteristic of the shingles by joining the roof facets together using Z-shaped gable and valley trim. Also, the contractor and installer had to use starter strip in a unique way to ensure that the roof could resist high winds and shed water properly. When the project was finally complete, the homeowner told the contractor that “no one could have done a better job on a harder roof.” According to Roberts, the end result was a significant upgrade in appearance from the original roof. The Oxford Shingle’s concealed fasteners and beautiful profile provide the distinctive natural beauty of a high end end slate roof with all the benefits of a metal roof. 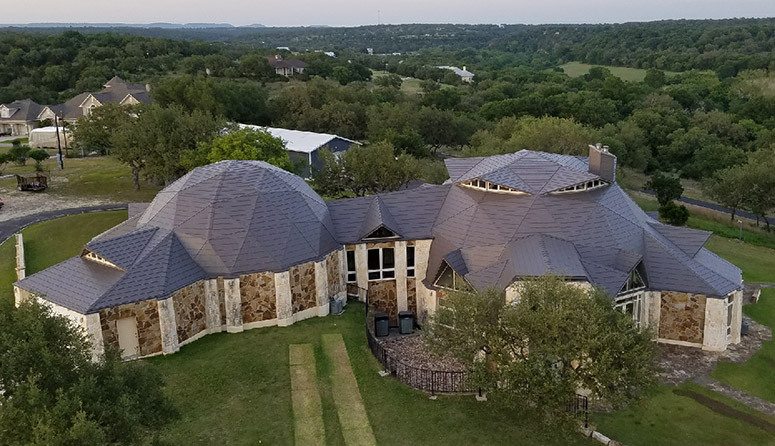 Complete with a baked-on PVDF finish from Valspar, the roof will retain its beauty and durability over several decades, unlike a composition roof which is unlikely to last more than 15 years in the harsh south Texas climate on such an intricate roof with water flowing from so many directions. 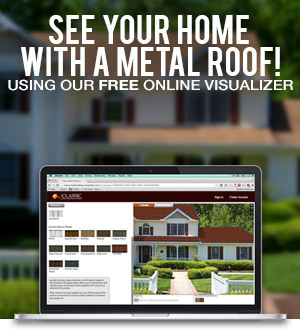 Furthermore, since the completion of the project, the aluminum roof will keep the homeowner’s energy bill lower than it would be with a non-metal roof. Written By: Evan Miller, Marketing Support, Isaiah Industries, Inc.